Crowded airports, long security lines and flight delays. Flying today is not the most pleasant experience, and Karl Lagerfeld thinks those aboard Chanel Airlines deserve a touch more glamor. The indefatigable 82-year-old fashion legend turned the glass-roofed Grand Palais exhibition hall in Paris into a departure lounge for his spring and summer ready-to-wear collection for 2016. 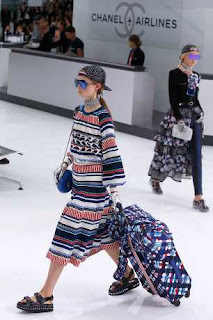 At Lagerfeld's “perfect airport,’’ everyone is dolled up in chic Chanel with flashes of luxury streetwear like a cap on backwards, a sweater casually draped over the shoulders and metallic gloves, shoes and hair accessories. Torsos were revealed at Chanel Airlines. “The inspiration is travel, travel around the whole world and of course perfect boarding conditions, which is not necessarily reality,'' Lagerfeld told AFP. Lagerfeld said he has been working on the typically elaborate decor for six months. It included a giant board announcing upcoming flights, check-in counters, special Chanel Airline trolleys that fashionistas grabbed for a selfie, and boarding gate number five – a nod to the fashion house's famous perfume. “Airports today are not the funniest thing in the world,'' Lagerfeld said. “This is the proposition of a perfect trip to a perfect destination with perfect modern clothes with touches of streetwear but in expensive materials, well done and quite sophisticated. Top model turned actress Cara Delevingne was in the front row as was Vanessa Paradis and her daughter with ex-husband Johnny Depp, Lily-Rose. Sports stars Lewis Hamilton and Maria Sharapova were also along for the ride. Kendall Jenner, Lagerfeld's latest muse, led the pack of youthful models who wore classic printed tweed looks with skirts grazing below the knee, accessorized with metallic gloves and a cap on back to front. Large sunglasses, a rectangular block of blue eyeshadow and metallic and plastic lace-up shoes gave an urban edge to Chanel's classic suits. Their hair was parted into a double ponytail with a wide metallic clip – a nod to Lagerfeld's iconic ponytail. The designer unveiled dozens of new looks, including a series of classic suits and dresses in white trimmed with colorful floral prints, and silver sequined tops paired with black bottoms such as wide-legged leather trousers layered with a skirt. The skirt over trousers look was seen on several models, paired with chunky wedge sandals. But in between the brightly colored and busy prints, were more classic Chanel suits teamed with identical boxy little hats. One model wore a tweed jumpsuit with a chequered yellow and pink pattern, dragging “Coco Case'' luggage behind her on the vast runway.